Waacking, krumping, popping, locking and hip hop – what stylin’ moves would your team choose for a dance-floor battle? All are the well-executed, energy-driven weapons of choice for Funky Facilitators. The crew currently consists of street dancers specializing in expressive free styles and DJs. 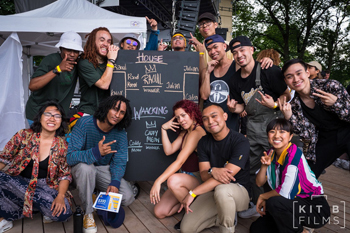 What started as a group of like-minded friends two years ago who wanted to provide more social spaces for other free-styling dancers, Funky Facilitators is earning event-planning cred for elevating the status of street dance through festivals and events around the GTA. Referring to themselves as a community building group, they throw social events, organize and execute battles (big and small) and hold workshops to get the party started. Funky Facilitators was on hand at last month’s The Bentway Block Party, kicking off the event with house dance and hustle workshops to those attending the day-long celebration that marked the phase-one completion of a very-cool public space. The group also organized a dynamic dance battle as the Bentway’s main feature event. The competition had two categories open to the public, Waacking (a sassy, disco dance) and House (a soulful, fancy footwork dance), both with origins from the late ’70s and early ’80s. Live DJs (Dirty Dale, Iced Misto, and RVIN) got the competitors amped and spectators grooving. Street dance judging is based on several elements, including technique, originality, performance, expression, battle motive and connection to the music.